Our kitchen cupboards are beadboard, and this cabinet end was nicely finished. Yet it seemed that this space could probably be put to some purpose. . . I just never could figure out what that purpose should be. For awhile I thought that I shouldn't do anything to make this space too informal, since it's right beside the door into our dining room. Then it occurred to me that, since this spot is where our dog's food bowl sits, the atmosphere there was already pretty informal. 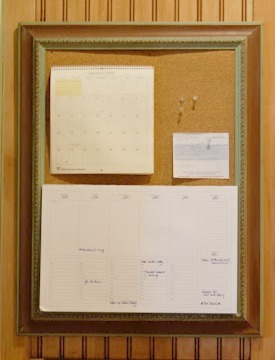 But we needed a corkboard more than we needed a chalkboard, so I cut some foamboard to fit the frame, then glued on a sheet of cork. 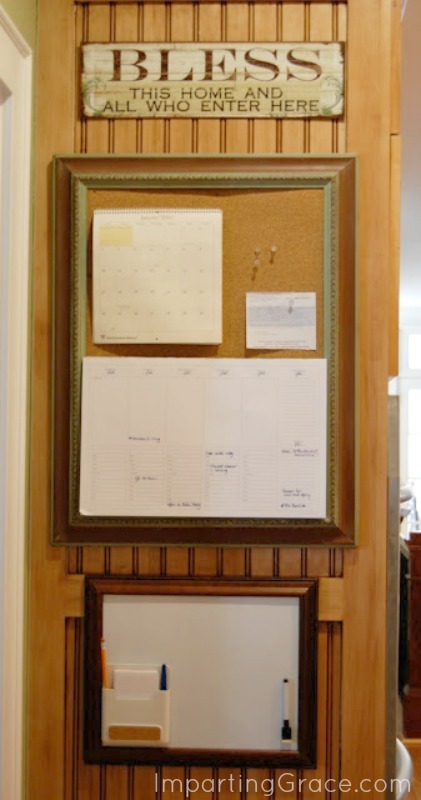 Now we have a place for our calendars with some room left over to pin up other important papers. 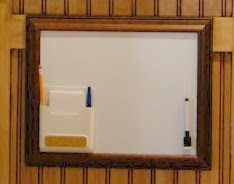 I used the smaller frame to make an attractive white board. I found a magnetic white board and pen in Target's One Spot. To make it fit the frame, I had to cut about an inch off the white board, but that was easy to do. The note card and pen holder is magnetic, so I just stuck it onto the whiteboard. We use the white board only occasionally, but we use that note card holder a lot. I keep blank 3x5 cards in it, which cost about 50 cents for 100 cards. No one ever has to search for a piece of paper to leave a note or make a list. The tin sign I found at Hobby Lobby, on sale for $4.99. This wall is one of the first things you see if you enter the house through the garage or the side door of the front porch, so I like this little blessing. My middle son says it's a little too reminiscent of the inscription at the entrance to hell in Dante's Inferno ("Abandon all hope ye who enter here"), but he's 16, so he's supposed to say things like that. Maybe having this planning center will make me much more organized than I've ever been before. There's plenty of room on the large weekly calendar. In addition to appointments and due dates and practice times, I could plan and post menus! Or schedule my blog posts! The possibilities are endless. Okay, maybe for those goals I should abandon all hope. But overall I'm very pleased with my project. I'm happy with it! What do you think? Do you have a command center in your home? and Metamorphosis Monday at Between Naps on the Porch. I love what you did in that space. It looks great and really "fits" that location. Looks terrific! The perfect location for a planning center and it fits nicely into that space. Great idea. Looks really good. I love it!! Great idea!! I'm always looking for ways to be more organized. what a great idea! you have inspired me to do something with the end of my kitchen cupboard! Love it - cute and also so useful ! 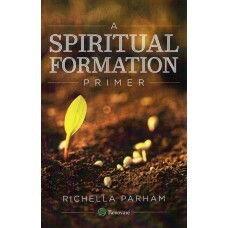 Ooooh Richella! I love it! It looks so good! :) Woohoo! I am the same way with projects. I know that I want to do something in a space, but I wait until the right idea or inspiration comes along. What you did looks great!! I love how you have made that wall work! I have the same situation in my kitchen and have always wanted to use the space, but am afraid to hammer a nail in until I am positively sure. I think I will get my hammer out tomorrow! Thanks for the inspiration. Awesome! We need a planning center in our house too. what great use of the space! And you know a thing or two about loving a little dude, don't you ;)...always adore your visits Richella! I have a corner like that in the kitchen and have it set up marginally well. Seeing this, I need to rethink the space and turn it into a message center! I am impressed that your 16 year old recognized the similarities in the quotes. Heavy reading for a 16 year old! :) HL has the best signs! Great job! We have been in this house for 1.5 years and I still haven't found the right spot for a planning center. For now, my calendar is on the fridge... and I don't like having stuff on my fridge. But I also need to have things out where I see them. Your spot looks great... useful and attractive! Blessings! Looks great and what a wonderful way to use space. I love a "command center."